The Excellerator skipping rope Professional (elastic) is adjustable in length. 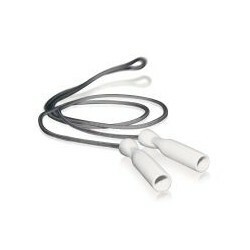 Using the Excellerator skipping rope Professional, gymnastics as well as strength exercises can be accomplished. This is made possible by use of an elastic rope material. 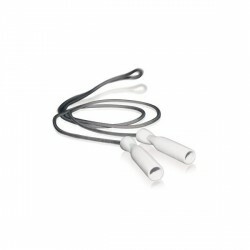 The Excellerator skipping rope Professional can be used as skipping rope and tube. Ergonomic grips and ball-bearings make the use extremely comfortable. Additional weights are available as optional accessory for the grips of the Excellerator skipping rope Professional - for an additional workout of wrists and arms. Sehr gutes Springseil, gute Kugellager, allerdings war es für meine Körpergröße von knapp über 1,90 m zu kurz.